I’ve spent an inordinate amount of time thinking about the US presidential race in the last several months. It’s become a bit of an obsession, so I figured I should write down a bunch of my thoughts once and for all. I recognize that commenting on a current election cycle has the very real risk of becoming very old news very fast, so I’d like to start by talking about a longer-term issue. Every political movement starts with something that it identifies as a problem to be fixed. Donald Trump says that America doesn’t win anymore. Bernie Sanders identifies the core problem as Wall Street. Marco Rubio says that Barack Obama has abandoned American exceptionalism (and knows exactly what he’s doing). I’d like to offer a different take. Within my own lifetime, we’ve seen a rather disturbing trend that makes it impossible to fix any of these problems. No, I don’t think it’s money in politics — as far as I can tell, the politicians still reflect the voters who elect them. The giant detractor, affecting everything from healthcare to national security, mass shootings to abortion, is partisanship. 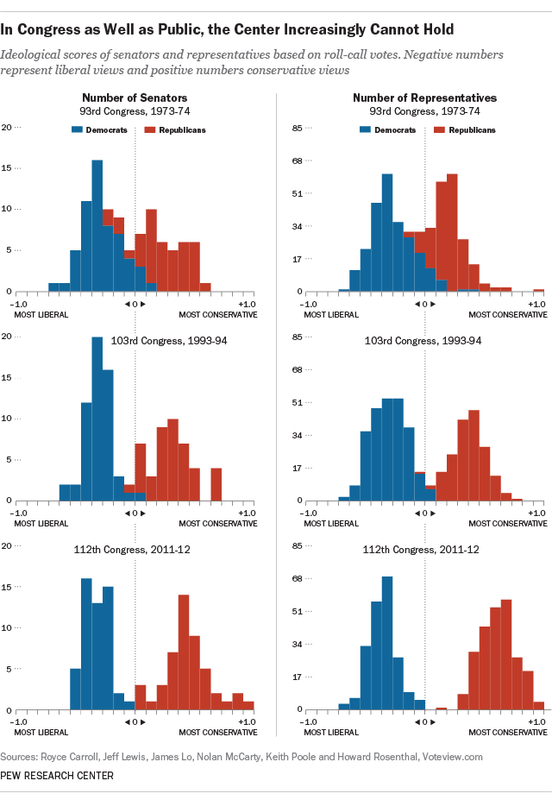 Growing ideological consistency: Believe it or not, in 1994, only 64% of Republicans were more conservative than the median Democrat (and 70% the other way). In 2014, those numbers were 92% and 94%. This has only gotten worse since 2014. Most recently, after Supreme Court Justice Antonin Scalia died, within a day, senators on both sides were proclaiming whether Obama would nominate his replacement, seeing the next justice as the tiebreaker between conservatives and liberals. Meanwhile, numerous news stories pointed out the robust friendships between Scalia and some of the liberal justices on the court, Ruth Bader Ginsberg and Elena Kagen. In contrast to Congress and the public, the justices’ bonds seem almost outdated, products of a bygone era of bipartisan collaboration in which we are no longer worthy to live. 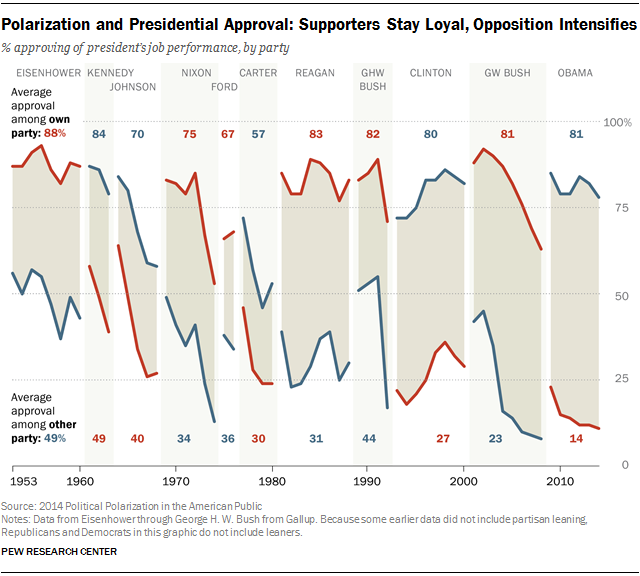 Naturally, many believe that the other party is at fault for this partisanship. They declared war first! Yet both parties have been moving further apart on the ideological spectrum, as the viability of candidates like Cruz and Sanders show. Consider how out of place 2004 presidential candidates like George W. Bush and John Kerry would look in today’s Republican and Democratic parties just over a decade later. Why has this only happened now, when we’ve had the same two-party system for over a century? Pew offers this partial explanation: Regional differences used to also be important, and offered contrasts on different axes than the current left and right, but mobility has aligned the axes. Liberals are now much more likely to want to live in cities, while conservatives want more space to themselves. The notion of “red states” and “blue states” only arose in 2000, though it feels like it’s been around forever now. I’d also add that the US hasn’t faced the need to unite to fight a common enemy, as we did in World War Two and to a lesser extent in the Cold War. Absent that greater sense of purpose, we’ve focused more on alternative visions of where our country should be going. I blame the media, I really do. Remember, from within a system no one necessarily has an incentive to do what the system as a whole is supposed to do. Daily Kos or someone has a little label saying “supports liberal ideas”, but actually their incentive is to make liberals want to click on their pages and ads. If the quickest way to do that is by writing story after satisfying story of how dumb Republicans are, and what wonderful taste they have for being members of the Blue Tribe instead of evil mutants, then they’ll do that even if the effect on the entire system is to make Republicans hate them and by extension everything they stand for. I didn’t have any idea either, until this election cycle. KASICH: Well, John, first of all, if I were president, we wouldn’t have the divisions in the country we have today. And I do wanna take a second as we reflected on Judge Scalia, it’s amazing. It’s not even two minutes after the death of Judge Scalia, nine children here today, their father didn’t wake up– his wife– you know, sad, but– you know, I just wish we hadn’t run so fast into politics. Here’s my concern about this. The country’s so divided right now, and now we’re going to see another partisan fight taking place. I really wish the president would think about not nominating somebody. If you were to nominate somebody, let’s have him pick somebody that is gonna have unanimous approval and such widespread approval across the country that this could happen without– a lotta recrimination. It does hurt to see Scalia’s death tightening the ranks on each side, as all of the GOP senators on the appropriate committee refuse to schedule hearings while liberal senators cry foul. It’s not going to get any nicer once Obama selects someone, as he says he will. How will Kasich solve this problem? He realizes correctly that the strength of the United States is not our unanimity, it’s our unity amidst diversity. The solution to growing disconnect is to allow the major different visions for where this country should be going their own autonomy. This is precisely why so much of Kasich’s campaign is about returning power from the federal government to the states, whatever the issue, from education to infrastructure to job training to health care. This reminds me in many ways of Scott Alexander’s Archipelago vision. Letting states decide more would actually solve many of the problems of polarization. If the country is so divided into red states and blue states, let each do their own thing as they see fit. Over time, the best innovations will shine and spread. The impressive agility of a small country like Singapore suggests that nationwide experiments are not the best way to introduce change. We’re already seeing this now as some states experiment with marijuana legalization. Over time, we’ll be able to tease out the effects and decide whether this is a good idea everywhere. On social issues, Kasich seems to have the most consistently Christian message out there. He minces no words about the crime of abortion, and recently defunded Planned Parenthood in his state. But just as important to him is the lifting up the most vulnerable adults, particularly the mentally ill and addicted. It’s high time Christians involved in the political sphere were passionate about lifting all of the downtrodden, not just the victim classes that one partisan side has claimed. Kasich, who seems truly transformed by this campaign–in a good way–was also talking about the comforts of citizenship. He was suggesting that there was an antidote to all the free-range anger out there–lazy, uninformed, self-indulgent, media-induced anger–and it involved prying ourselves away from the flat-screens that rule our lives and becoming part of a community again. This was immediately dismissed–it was called “chicken soup for the soul” politics–by too many of my colleagues. They pointed out that […] Kasich was probably doomed in South Carolina and the rest of the red-meat South. In fact, Kasich has run a beautifully weird, unscripted campaign–talking about how to actually make government work, as he has as governor of Ohio, offering his flagrant humanity and refraining from negative ads. There was clearly no long-term place for that sort of thing in American politics. Or is there? There’s something about unscripted campaigning: It allows the candidates to get better over time, as they learn to relate to the people they meet. The major criticism of Kasich has been that he simply doesn’t have a chance in this primary. This argument has been especially prominent lately, as fears of a Trump sweep have led some to encourage Kasich to drop out. For instance, Ross Douthat hesitatingly suggests and then defends that perhaps Rubio should offer Kasich the vice-presidential slot in exchange for his endorsement, analyzing the pro’s and con’s. Let alone the fact that Kasich doesn’t want that, I’d argue that it would fall far short of fixing the problem of partisanship. The centrist Biden hasn’t been able to tame the passions of the partisan Obama, and Rubio’s continual attacks on Obama will only make Democrats less likely to cooperate if he is president. Kasich becomes the nominee by first having Trump run the table in the South on Super Tuesday, thus effectively killing off Ted Cruz and putting Rubio back on life support; then Kasich narrowly beats Trump in Michigan and Ohio and Illinois on March 8 and March 15th while Rubio loses Florida to the Donald, ending the Florida senator’s hopes; and then, with Trump ascendant, Kasich becomes the last-hope choice of every not-Trump voter and donor and runs the table in the blue state primaries in April. Kasich is on the rise. He’s seeing bigger and bigger crowds in the March 1 states than he got in South Carolina, which were bigger than the ones in New Hampshire. He’s rapidly expanding his campaign infrastructure to compete broadly, and choosing to focus on that rather than compete in the very unfriendly South Carolina and Nevada. Kasich is touting his favorable head-to-head matchups with Clinton, and picking up more billionaire endorsements. Contrast this with the faded and fading candidates who will drop out first: Jeb Bush had been on the decline for months, burned through all of his cash and family connections to compete in South Carolina, and went out with a whimper. Ben Carson similarly proclaimed that South Carolina would treat him better before coming in last there; he’ll probably drop out very soon. Even Cruz is busy putting out fires, from firing his campaign spokesman to pulling ads off the air to avoid controversy. All of those campaigns have already peaked in prominence: Bush when he raised a bunch of money, Carson when he caught Trump in national polls, and Cruz when he won Iowa. Kasich is just beginning to pick up steam, and the only question is if his peak will come too late. It’s not a big edge, but voters in South Carolina seemed to be more frequently deciding between Bush and Kasich than between Bush and Rubio. Of course, I’d love if someone compiled all of this second-favorite-candidate data across many different polls, but this at least passes the eye test. 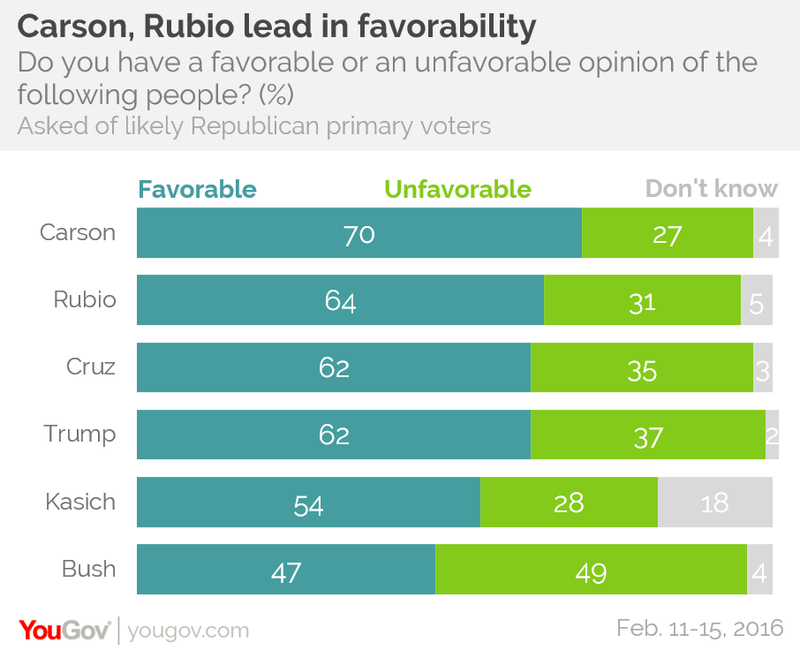 Rubio is more in the conservative lane than the “establishment” lane with the governors. On top of that, the Bush Super PAC will no longer be airing all of its negative ads against Kasich. I don’t have the numbers handy, but Bush’s Super PAC, Right to Rise, probably spent more in negative ads against Kasich than he was able to spend for himself. Among these six candidates, Kasich has by far the largest percentage who don’t know him. But this also gives him the most opportunity to rise with voters who haven’t been paying nearly as close attention to the race as I have. Maybe even viewers like you. No one can land a punch on him. In the New Hampshire debate, there was a remarkable contrast. Right before Rubio repeated his memorized Obama line for the fourth time (“He knows exactly what he’s doing!”), Governor Christie was asked if he wanted to criticize Kasich’s record, and he basically said no, he didn’t: “He’s done a very good job as governor of Ohio.” Now, Christie and Kasich are friends, so I can understand that they wouldn’t want to fight. But that debate contrasted how much more vulnerable Rubio is to a concerted attack than Kasich. Even Trump has said positive things about Kasich the couple of times that Kasich has argued a similar point to him, leading some to speculate that he too might choose Kasich as a VP. Now, all of that might change with Trump’s favorite punching bag out of the race, but he seems pretty content to go after Ted Cruz for now. Carson drops out in the next couple days, leaving only four spots on the debate stage on Thursday, and longer speaking time for each candidate. With the increased media exposure, Kasich rises to the mid-teens in national polls, to nearly the same level as Rubio. Cruz and Rubio target each other heavily, with even more negative attacks, driving both of their favorability ratings down and increasing both candidates’ irritability and nervousness. Meanwhile, Kasich continues to be renewed by the positive messages he hears. Trump continues to assault Cruz and starts to find new things to criticize Rubio for. Among the remaining candidates, Kasich contrasts so sharply with the others in terms of civility, experience and optimism that voters with desires in those directions flock to him. Bush made experience look like entitlement, and without that negative association, Kasich’s experience becomes a big plus. Despite downplaying the results, Kasich picks up the most late-deciding voters and gets at least a handful of second-place finishes (maybe three out of MN, VT, MA, TN, VA?) on March 1st, which surprises many who already count him out. All of these states award proportionally, so Kasich will pick up handfuls of delegates from those finishes. After Super Tuesday, he is still in fourth in delegates, but Cruz and Rubio split their votes relatively evenly with Trump in the lead. In particular, Cruz wins Texas, keeping him in the race a while longer. As the pressure builds to rise, Rubio cracks again in a way that brings his inexperience to the forefront of voters’ minds, and makes them rush to Kasich the way they did in New Hampshire. Hillary Clinton does particularly well in almost all of the Democratic primaries on Super Tuesday, making the Democratic nomination seem over. Many independent moderates flock to the Republican side to support Kasich in open primaries in Michigan, Illinois and other important states for him. A win in Michigan on March 8th propels Kasich into 1st in the winner-take-all Illinois, Ohio and Missouri, jumping his delegate total into second place overall. Meanwhile, Trump and Rubio focus their efforts on Florida, which Trump sees as his best opportunity to defeat Rubio once and for all. Rubio ekes out a victory, but is severely weakened by having to focus on defending his home state. Cruz drops out around this point. One-on-one, Kasich’s sincerity and compassion disarm Trump’s vicious attacks which come with the narrower field. Midwestern Wisconsin (4/5), Pennsylvania (4/16), Indiana (5/3), and Nebraska (5/10) help Kasich make up remaining ground with Trump, before the finishing blow in California (6/7) and New Jersey (6/7). Edit: Looks like I misread who Christie was going to endorse… Strike New Jersey off that list. Far-fetched? Maybe a little. But Kasich does actually have a more favorable schedule for catching up after falling behind than Rubio or Cruz, especially once the Democratic nomination effectively wraps up. After all, Florida is a closed primary, but Ohio is open. And the media exposure of the next week or so, without any more results coming in, will give him a chance to introduce himself to the people who would vote for him but simply haven’t heard his message yet. How does the math work out? The 9 winner-take-all states I listed alone provide 609 delegates, about half of the delegates needed to win the nomination. The other 45 states and territories could provide the remaining 600, with more towards the end of the schedule as the race deepens. Let’s be honest: If I were betting (and I’m not), I wouldn’t take this scenario as likelier than 5-10%. But I think Kasich’s message is worth a blog post to try to promote before it’s too late.